We are nearing the end of our sermon series on “How to Be a Christian in 7 Easy Steps.” As we conclude the last few weeks, I hope that you find yourselves enriched by this exploration of the core of our Christian faith. Like every person on this planet, I am no stranger to grief. And while in my privilege I acknowledge that I have endured far less suffering than many others, we also may understand that there are many parallels in painful experiences. My personal experiences of pain and suffering are largely related to loss through death. These include the loss of my mother from cancer, a close friend in Jr. High school from a car accident, and more recently the mother of two dear friends killed in her own home. I am grateful for counselors, teachers, and helpful programs that guide us through the stages of grief in healthy ways. On a side note, interested persons are invited to join our ongoing GriefShare program held Sunday afternoons. Contact the Church office for more detail. 15It was customary during the festival for the governor to release to the crowd one prisoner, whomever they might choose. 16At that time there was a well-known prisoner named Jesus Barabbas. 17When the crowd had come together, Pilate asked them, “Whom would you like me to release to you, Jesus Barabbas or Jesus who is called Christ?” 18He knew that the leaders of the people had handed him over because of jealousy. 25All the people replied, “Let his blood be on us and on our children.” 26Then he released Barabbas to them. He had Jesus whipped, then handed him over to be crucified. 27The governor’s soldiers took Jesus into the governor’s house, and they gathered the whole company of soldiers around him. 28They stripped him and put a red military coat on him. 29They twisted together a crown of thorns and put it on his head. They put a stick in his right hand. Then they bowed down in front of him and mocked him, saying, “Hey! King of the Jews!” 30After they spit on him, they took the stick and struck his head again and again. 31When they finished mocking him, they stripped him of the military coat and put his own clothes back on him. They led him away to crucify him. How have you experienced grief and/or suffering? Have you ever experienced God’s presence in suffering? If you have, how did God’s presence affect you? What does this say to you about God’s presence in dark times? One of the stories shared in this message was about a man who found peace with the idea that God had journeyed grief as well, and that God might be able to lead him through his own pilgrimage. Have you felt a kinship with those who have had similar challenges or experiences that you have had? Does the idea of God’s grief at the Crucifixion change your perception of the story of Jesus’ death? If so, how? What does this say to you about the annual remembrance of Jesus’ crucifixion on Good Friday? Does its importance change? I invite you to consider the interactive prayer stations held at our church on Friday, April 14th any time between 5:00pm and 7:30pm. Explore what may be a different approach to Good Friday and see how God may speak to you on the journey. Find a bit more detail along with a map and directions by clicking the button below. 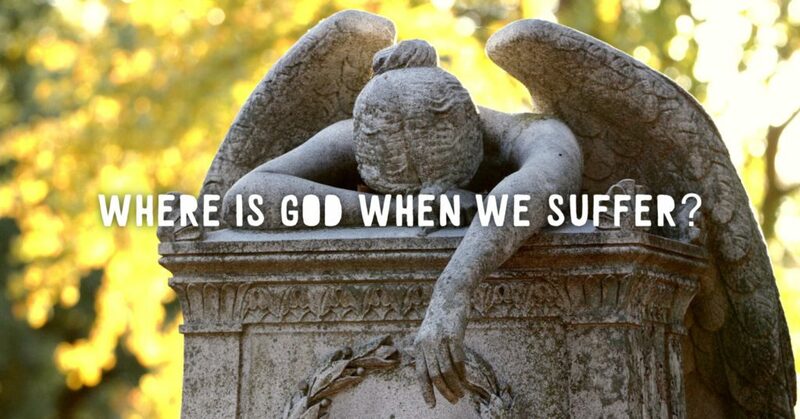 I wish I coukd affirm that I always felt God’s comforting presence at times of sorrow and loss, but I usually do not. Instead, I am more likely reached through friends, a hymn, a phrase in a book. God DOES reach me, just not always right when I ask. And that is ok, although the occasional burning bush WOULD be nice!